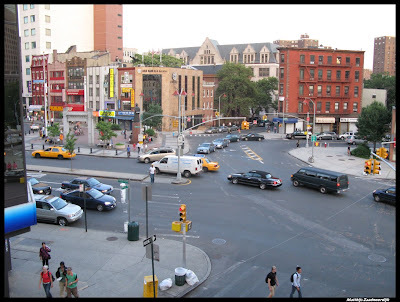 Civic Center Residents Coalition NYC: DOT Says Chatham Square Redo needed 'cause it's not safe, oh really?? DOT Says Chatham Square Redo needed 'cause it's not safe, oh really?? According to a 2004 article in the Villager newspaper Canal street is one of the most dangerous streets to cross in the City! Hmm.... cyclists know this, pedestrians know this, CCRC knows this and I'm guessing more than one person in DOT knows about this BY NOW! In 2008 - 2009 what's on the priority list for DOT fixes? NOT Canal street. That's going to remain as unsafe as ever. Instead $50 million dollars suddenly became available to improve Chatham Square, citing safety concerns. Chinatown leaders and businesses have been complaining about accidents on Canal St., Bowery, Alan St. for years and not much has been done. So what's the hurry with the Chatham Square's redo if it's not even on the list of the most unsafe intersections in NYC? We keep hearing about how unsafe it is, but surely when it comes to ACTUAL accidents, ACTUAL deaths, actual suffering Canal street, Houston Street, 6th Ave., has this part of the City beat hands down. Clearly the D.O.T. planner who did the last Chatham Square design had a great sense of humor because he left us with bicyle-ramp planters and a traffic configuration he drew on a napkin five minutes before his meeting with the contractors. I think what Chatham Square needs is a gallows from which to hang the moron who designed it the last time. I know how dangerous Chatham Square is, I bike through it, drive through it and walk through it every single week. Thanks to the failed design we're left with, and the closing of Park Row Chatham Square can definitely use improvement, no one's arguing that the DOT screwed it up, the fact of the matter is however, that there are more accidents on Canal Street than Chatham Square. See the Villager article here. One particularly irksome side issue to all of this is that CB#3 has acted more like a bureaucratic city agency, disposed more to advancing city agendas and timeframes, and less as an advocacy voice of the community, all of which runs counter to the initial spirit and purpose upon which community boards were established in the first place. It was evident at the Community Board "hearing" last night that the City has not done any analysis of pedestrian safety of either the current configuration or their proposed plan. Several speakers pointed out some glaring gaps in safety in the proposed plan. This plan is being pushed by the NYPD in order to make Park Row flow into a dead end - not for safety but in its continuing war against the community. And the DOT is once again abdicating its responsibility and are acting as puppets of the NYPD instead of as an independent agency. The problem with running the City "like a corporation" is that corporations are not democracies. Bring Democracy back to New York City - don't give Bloomberg another term as mayor!